i love long weekends! we’ve just had two in a row here in australia, with easter and then ANZAC day (a weekend to commemorate our armed service-men and women). this also means that there has been plenty of brunching over the past 11 days. i keep hearing about a cafe in prahran that is getting a lot of attention and buzz around melbourne as another “it” place for breaky, so this morning hubby and i decided to check it out. we took a lovely wander past the shrine of remembrance and through fawkner park along st kilda road and then headed down to 60 commercial rd. my grumbling tummy wasn’t happy to meet with a crowd of about 20 people standing outside “tall timber” and i inwardly groaned about the likely wait. to my pleasant surprise though, after putting our name on the list with the super-friendly steve, we were seated in about 10 minutes… win! the inside decor is delightful with plenty of crate-shelves, plants and wooden chairs aiding to create a really funky interior. there is a great big bench table and some window seats and a window bar. 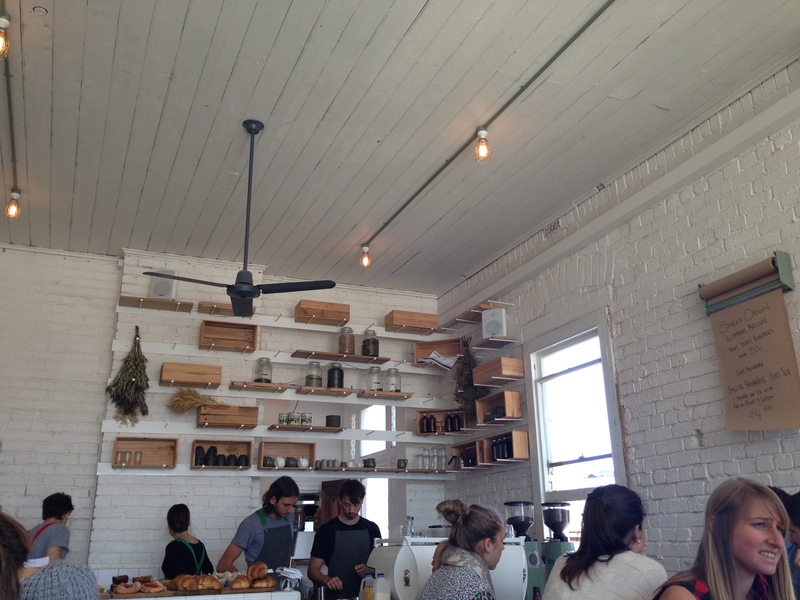 teemed with the uber-tall timber ceilings and light-airy feeling… the cafe has a great atmosphere. 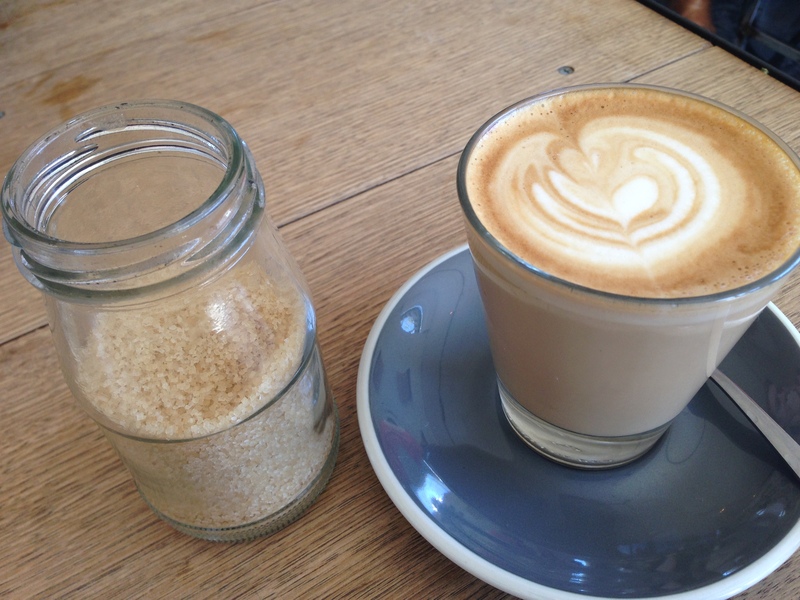 the coffee is also divine, the right amount of flavour, smoothness and warmth. however, very disappointed to find that the only cold drink on themenu is oj. not even aj available. 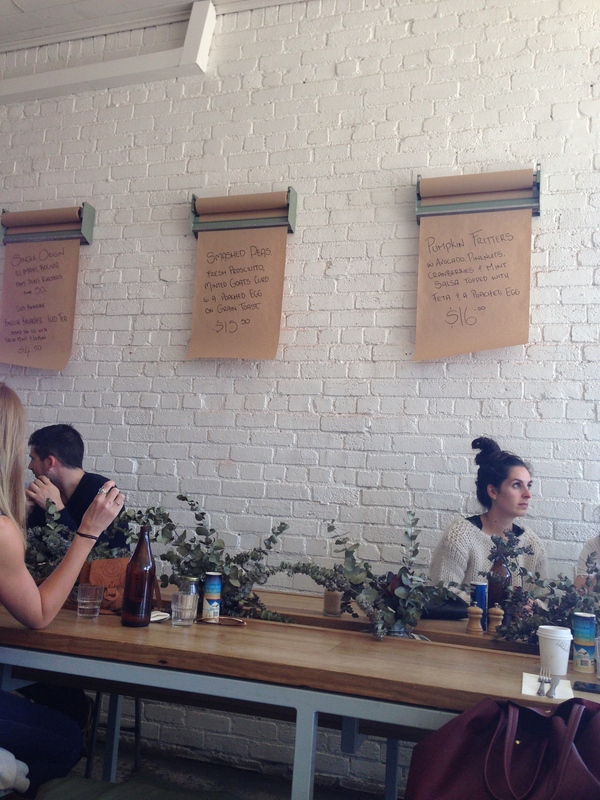 a silly presumption that “surely everyone in melbourne drinks coffee?!”. 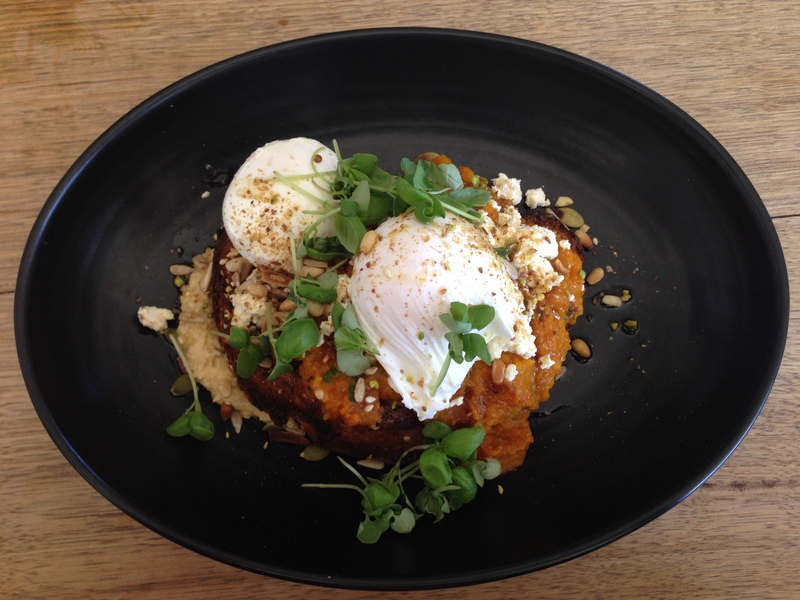 pumpkin bruschetta with poached eggs, feta, hummus, watercress and dukkah served on quinoa bread. with such an interesting combination of ingredients, i really expected this dish to pack a punch. unfortunately, it lacked seasoning, even after i loaded on the pepper, and didn’t really satisfy as i expected. on the plus side, the poached eggs were runny. poached eggs and bacon again, poached eggs were well cooked with runny yokes. 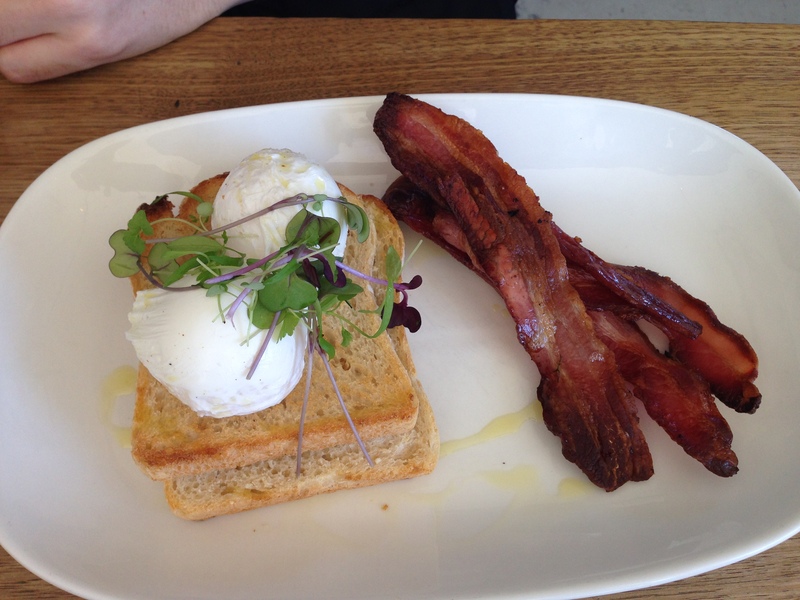 but being somewhat of an expert in bacon + eggs, my husband was disappointed with the bacon. only 3 small rashers, overly fatty and crispy american style. 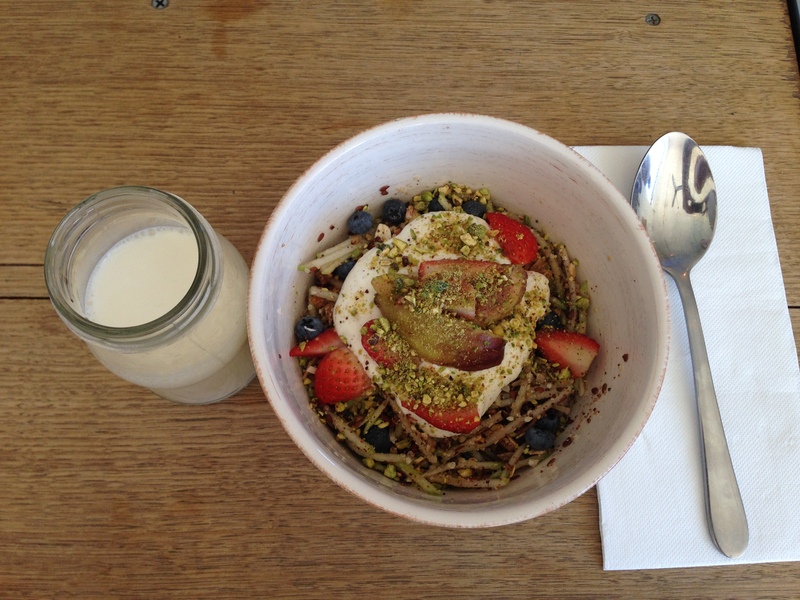 wild cacao, goji & organic oat muesli with seasonal fruit and honey vanilla yoghurt. after a small mix-up where we were mistakingly delivered a “granola slice”, i was relieved to finish our meal on a high with this delicious, fresh and tasty “granola”. topped with figs, strawberries and blueberries, and the yoghurt was delicious. a really good serving size, even for the two of us sharing. 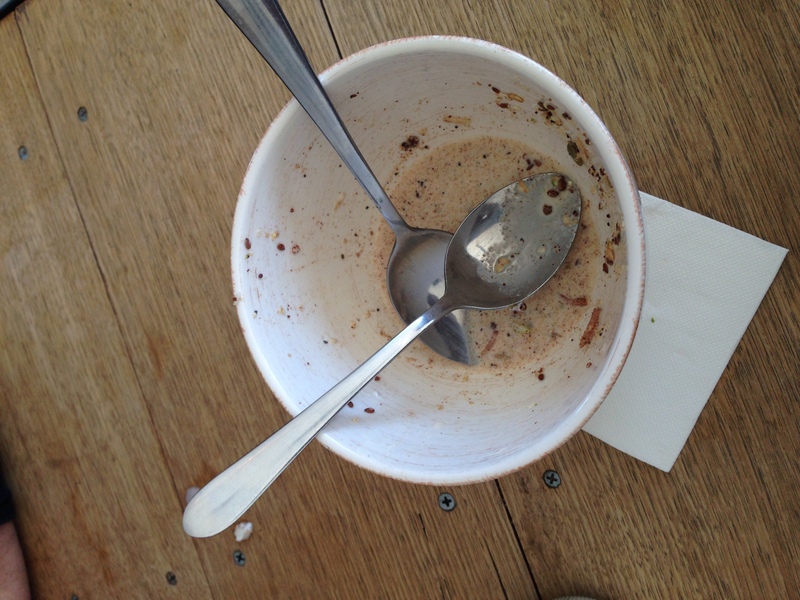 so so so good, as you can see from the completely empty bowl. looking around us, i could see an over-abundance of orders for the pastries and muffins from the front counter, or the toasts, banana bread or bircher muesli. and all of these plates were polished off with plenty of looks of delight. not so much for the cooked plates, where i saw a few (like mine) head back to the kitchen with quite a bit left on the plate. i would head back again for the coffee and a baked pastry or muesli – not so much for the cooked dishes. overall, it was a pretty good morning out and the 13km walk in the sun was definitely enjoyable (read: won’t be shouting from the rooftops for all and sundry to rush to try it out).